Richard Whitman, 29, and Cody Borner, 24, are accused of entering an apartment in Beulah, N.D., on Jan. 31 with loaded weapons, shooting and killing Michael Padilla and wounding his brother, Timothy Padilla. Whitman and Borner are each charged with two counts of conspiracy to commit murder. They will stand trial this week at the Burleigh County courthouse. The Tribune will be reporting the trial here as it happens. Pros asks how the jury can tell that he's not doing the same thing now. Whitman says he wants the truth to come out. Pros asks who created the dangerous situation. Whitman responds that the dangerous situation was created when the Padillas came after their guns. Pros: I think we're going to agree on one thing: That it wasn't thought out. Whitman says it wasn't thought out and that they didn't plan to use the guns. Pros asks if a dangerous situation was created when you go into an apt with loaded guns. Finck asks about Mike's demeanor when he gets up off the couch. Finck brings up his earlier assertion that Wiedrich used deceit in his interview with Whitman. Asks whether detective was using deceit during interview. Whitman admits that he said that. Simonson asks whether he was trying to protect Borner. And whether he was remorseful that Borner was involved. Whitman says he was making aggressive movements and speaking aggressively. Pros asks if he was remorseful about killing Mike. Asks Whitman if he said, "It couldn't have happened to a better f---er." Whitman is dismissed. Finck rests. We'll take a lunch break now. Does it seem like the DEF is trying to establish that padilla's are responsible for the outcome. That is certainly what Borner and Whitman testified to, but I can't speculate as to the strategy of their attys. That will come out in their closing arguments. 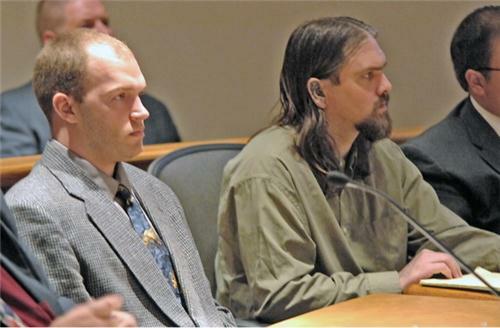 Cody Borner (left) and Richard Whitman (right) listen to testimony during their trial on Tuesday. If I understand correctly, the current charges are Conspiracy to Commit Murder. Can the indictment be amended to include Murder? Can a future indictment be brought forward? Just to avoid going down a slippery slope, I'm going to hold off on posting any opinions of the verdict. Feel free to keep asking any questions you might have, and we'll address them as we can. When is the presentence investigation? What does that entail? @TOOF A parole/probation officer will conduct the presentence investigations. A psi involves interviewing the defendants and gathering information about them, including criminal histories, work histories, family information, etc. They will probably begin the psi process as soon as possible. We've got a quick version of a story on the verdicts up at bit.ly/MBkvfl. It is strange that the jury would ask if they could return different verdicts for the defendants and then they return verdicts that are the same. They wouldn't ask the question if it wasn't an issue (I just don't think they would even think about that if the believed they were both guilty beyond a reasonable doubt). Although the judge did say the verdicts didn't have to be the same, I believe it was Rick's attorney that said it would be problematic in issuing 1 guilty verdict for conspiracy. It's as thought the jury decided that one person was for sure guilty, therefore the other would have to also be guilty. Also, this was a great blog. @lm It is hard to say what the jurors were discussing. If we find out, we'll let you know! I'll be floored if this holds up on appeal. Though, I did say the same thing about a jury coming back with a guility verdict for the double charges of conspiracy to commit murder. To be frank, and objective, the state did not prove the elements of that particular offense beyond a reasonable doubt. I am interested to hear the outcome once the presentence investigations have been completed. @bb Just so you understand, the presentence investigations are not open records, so the public does not get to see them. They are used by the judges to help determine appropriate sentences. They have no impact on the outcome of the case other than giving judges some perspective. @Jenny Michael: I do, and I should have specified. I am interested to hear the final outcome, as in the sentencing imposed. @bb Just wanted to make sure - I didn't explain the use of the psi that thoroughly.